In December 2011 the EU launched a graphene project called NanoMaster with an aim to develop up-scale processing methods for production of graphene and expanded graphite reinforced thermoplastic masterbatches and compounds. Today the project partners announced that the project is entering its final phase, and is reporting exciting results. Recently, the project team focused on optimizing and up-scaling the processes for graphene and expanded graphite production, and their subsequent compounding with a range of thermoplastics. They have now achieved a graphene production capacity increase from 50 grams to 2.5 Kg. 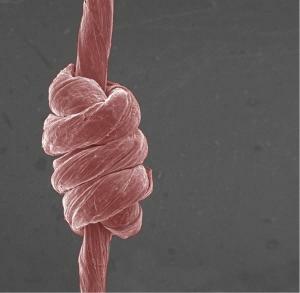 Researchers at from Korea's KAIST institute developed a new method to fabricate defect-free graphene. 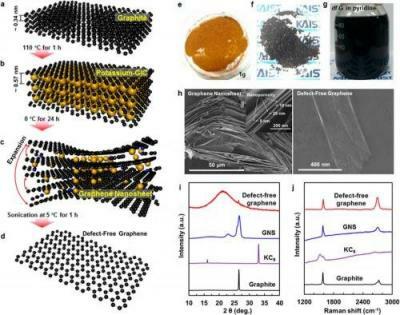 Using this graphene, they developed a promising high-performance anode for Li-Ion batteries. The method starts with a Pyrex tube and fill it with graphite powder. The open-ended tube is placed in another, larger tube and potassium is added to the gap between the tubes. The tubes are sealed and heated - which causes the potassium to move inside the micropores in the graphite powder - creating a potassium-graphite compound. This is placed in a pyridine solution, which expands the layer and separates them to form graphene nanosheets - which are then exfoliated to create a single graphene sheet. Researchers from the University of Osnabrück and the University of Duisburg-Essen have studied the hydration layers trapped between graphene and a hydrophilic substrate - when graphene is produced using exfoliation on a hydrophilic substrate. While it is possible to reduce that hydration layer (by heating it), the researchers demonstrated that it is principally impossible to completely drive this hydration layer out of the confined space. This layer will always influence the properties of the graphene on top of it. The researchers further demonstrated that it is possible to accelerate and to control the reorganization of the water (by 2D Ostwald ripening) that is present within the first hydration layer. Using this method, one can create "nanoblisters" filled with condensed fluid water. These nanoblisters could actually be a very suitable candidates for both storage and release of chemicals in aqueous environment.